Deals are the foundation of Backshop. Deals are similar to a balance sheet where Assets = Debt + Equity. The Assets of a CRE Deal are called Properties. The Debt is called a Loan, which is made up of one or more Notes. The Equity is called the Borrower or Owner. Conducting lease-by-lease underwritings of the Properties to calculate cash flow and value. 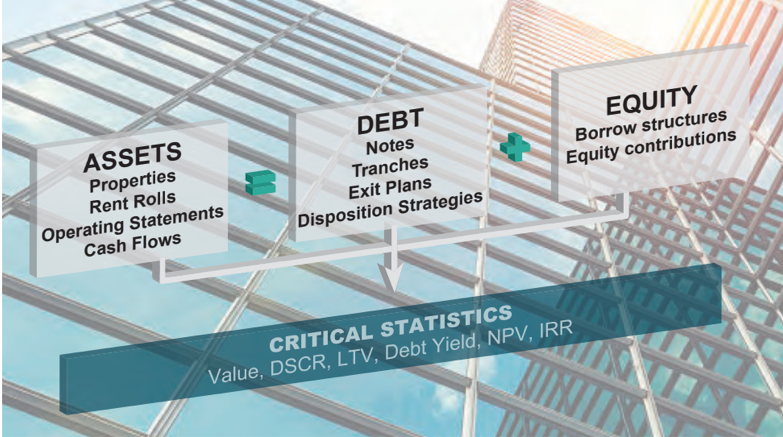 The Notes, their payment terms and priority are modeled and, when compared to the cash flow/value of the Properties, critical statistics like Loan to Value (LTV), Debt Service Coverage Ratio (DSCR) and Debt Yield are derived. Finally, the Equity is modeled with both the borrower structure and the upfront and ongoing equity contributions to calculate the IRR of the Equity Investment.